Italian dining in SLC seems to only have two gears: cheap, low-end chains, and ultra-expensive, yet tasty establishments. There aren’t too many Italian restaurants in SLC that serve high quality food at the lower price point. Then I heard about a new trattoria that opened in the old Z Pizzeria space on Stratford Avenue in Sugarhouse, and that the prices were very reasonable. It’s been on my “need to try” list for a while now. 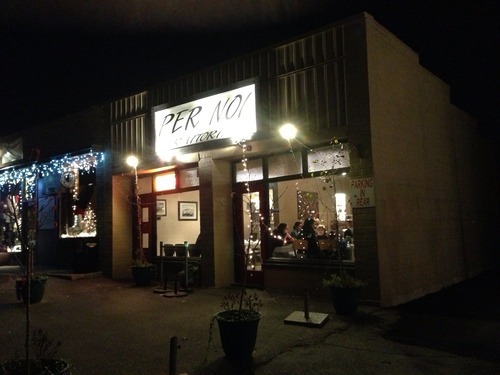 Per Noi is located in an older building with a few other businesses next to it. Parking is limited (look in the back for some additional spaces), but this corner oozes character. More than likely, when you enter the restaurant you’ll be greeted by the ever-ebullient owner of Per Noi, Francesco Montino. Francesco is very proud of his little space, and it shows. White tablecloths top the limited number of tables in the trattoria. The space is small, but doesn’t feel cramped. Servers are decked out in all black, and are very professional, milling about as Francesco greets every guest that walks through the door. After being seated, we were given a basket of delicious house-made bread, which was light and had a nutty, perfect crust. The balsamic was nice and fruity, and the olive oil had a strong peppery taste. 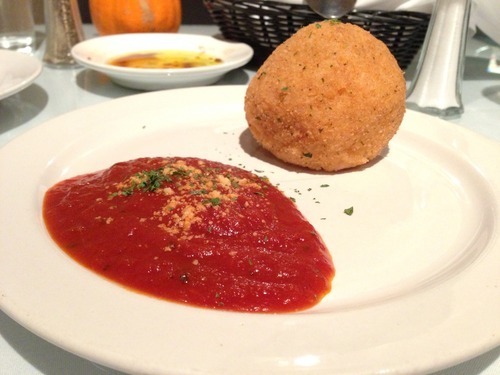 We started our meal with the Arancini – a ball of rice, peas, and mozzarella perfectly fried and served along with a lovely tomato sauce. About $6. Don’t let this picture fool you–it’s about the size of a baseball. For the entree I chose the Spaghetti Pescatore (Francesco later told me it is his favorite dish), and true to his word, it was fantastic. 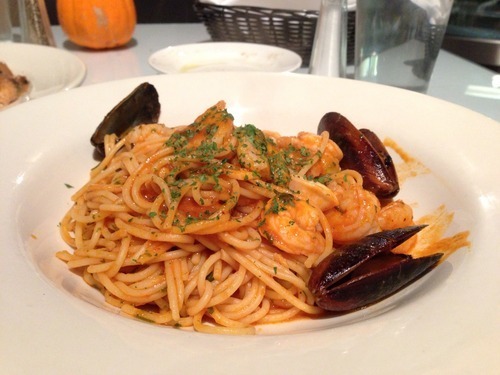 Spaghetti is cooked with a deliciously complex, nutty tomato sauce, mussels, scallops, calamari, and shrimp. The shrimp were a tad overcooked and a bit on the rubbery side, but it wasn’t a deal breaker due to the exceptional flavors. This is one of those dishes that will make it difficult to order any other entree during future visits, because I’m confident it will be hard to beat. The dish was around $13. 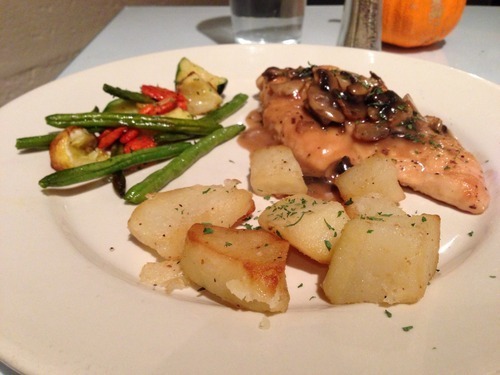 Melissa went with the Pollo Marsala, which is chicken served in a marsala wine sauce and topped with mushrooms. I wouldn’t get this dish again. The chicken was a bit on the tough and dry side, and the sauce wasn’t anything that I would order again. The dish was beautifully presented, but it just didn’t get along with my taste buds. I’m not sure what their corkage fee is, but we did see a couple bring in their own wine. It seems they’ve raised their prices about 20% since they opened, but it is still very reasonable. I remarked to Mel during our meal that this place reminds me of a small neighborhood trattoria that you would find in NYC or Italy. 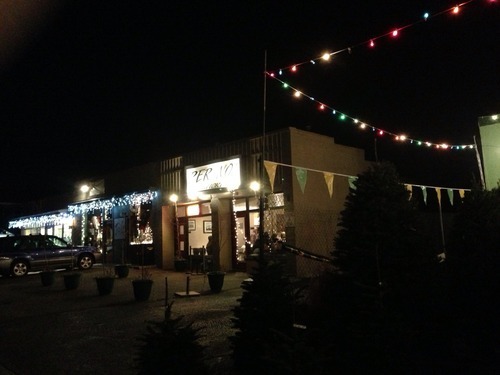 Small, family-run, with an owner who is extremely proud of the food coming out of his kitchen. And he has good reason to be proud of Per Noi.